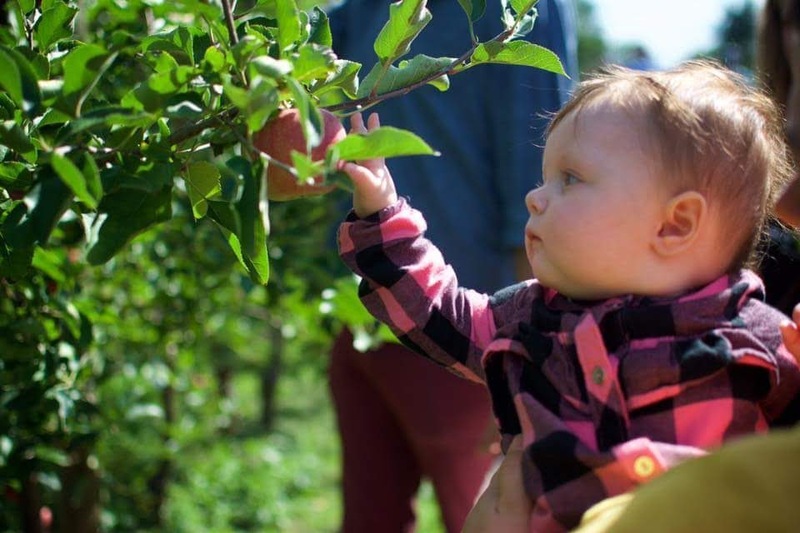 This past weekend we went apple picking. 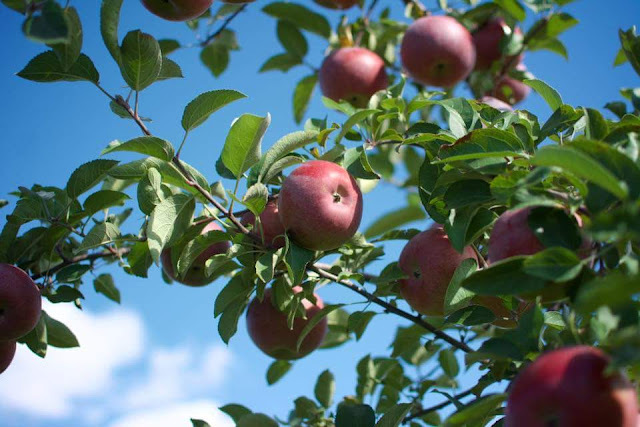 There are many farms in the area, but the one we went to was Gull Meadow Farms, as we have for the past few years. Ironically, both Breaky and I had been, but just never together. Each year, one of us had something else going on when the picking party commenced. I consider it the start of fall. Whether this was actually planned or not, we actually DID go the first day of fall. The weather cooperated like it was planned: sunny, but in the mid to low 60s (Fahrenheit). 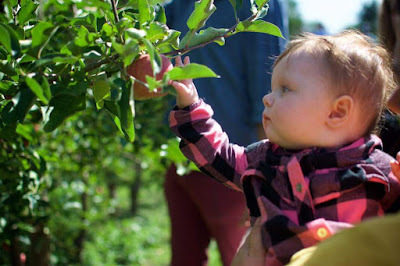 It was also BabyCPK's first time at a farm and apple picking. So many firsts in these past few months, it's really hard to keep track. We got Honey Crisp, Fuji, Gala, and a few other kinds of apples before calling it good. Breaky and I combined got just about a half a bushel. I don't know about anyone else, but whenever I hear the words "bushel" and "peck" I immediately think of the song "Bushel and a Peck"
A few nights ago I made a pretty decent bacon-wrapped pork chops with apples with a poor man's risotto. Last night, I made an apple pie. My recipe for that can be found here. That, however, was for dessert. For dinner, I made a Chicken Apple Stir Fry. I have to admit, I made this recipe from many different recipes on Pinterest, as is my way. Heck, that's how I created my ever-famous Jambalaya recipe. - Minced onion- I dunno, like, 1 tablespoon? - Cinnamon-Very very light sprinkling. Drizzle olive oil on skillet or wok. Cook chicken. Remove chicken. Cook carrots, peppers, zuchinni, minced onion and mushrooms until carrots are soft-ish. In separate bowl, add apple cider/juice, soy sauce, red pepper flakes, garlic powder and cinnamon and mix. 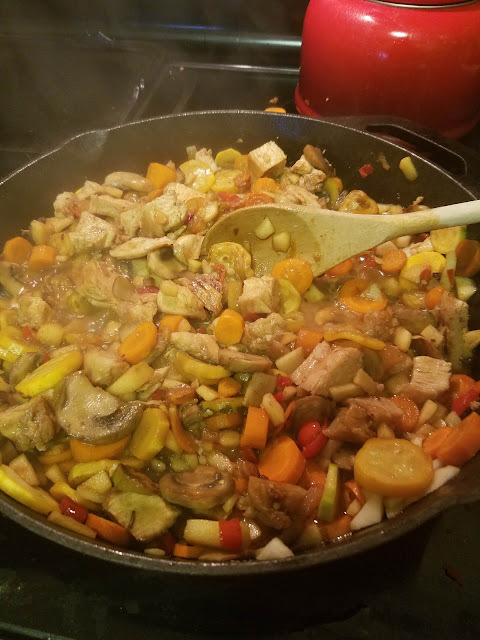 Add chicken and apples to skillet/wok. Stir together. Add liquid mixture. Serve over rice. You can use white rice, brown rice, cauliflower rice, I'm not going to discriminate. All would be really good. You do you. Turned out pretty good, if I may say so myself. Apple pie for dessert was of course pretty good. Enough about me. Happy Friday everyone! Enjoy your weekend. Recent events lead me to see if there was any research on esports and higher education. Surprisingly, there was not as much as I thought there would be. Obviously, the news articles and "experts" flooded the general search, but actual published, researched articles were not as numerous as I had maybe hoped. Most of what I saw related to the sports side of things; considering it a sport, which I believe it is, and how it can benefit intercollegiate sports within higher education. Part of me now wishes I had waited to do my master's degree so I can write another paper or two about this. Because while inserting a new sport or program of any kind is a great idea, making it thrive as a part of the university's culture is another. I'm not talking about the student side, which is still important, I'm talking about the nitty-gritty hierarchy, unwritten-rule politics that happens on the back-end. In esports, as a profession, the political climate is way different than that of a higher education institution. I have seen this first-hand in helping BreakyCPK with his dealings, contracts, negotiations. I have said several times in several different scenarios that things would be handled differently if this was happening in a university setting. Good and bad. Most publicly funded universities have a set of rules, regulations, processes, oversight etc... that esports just does not have. You have to be so very careful about what goes on during events and online for liability reasons. If anyone affiliated with a university said or did some of the controversial things I have seen professional esports players and streamers do, it would be an absolute nightmare for the university. Even Breaky, I find myself scolding him for things he says in certain ways, worried about potential fallout or repercussion. To which he normally replies, that's just how it is in esports. Many well-intentioned higher education professionals jump right in to esports, with their eye on keeping up with what students want (recruitment and retention) and making a profit. They will hire either sports professionals who know a little about esports, or hire esports professionals or streamers who know little to nothing about higher education. AP style is esports for competitive multiplayer video gaming. Use alternate forms like eSports or e-sports only if part of a formal name. Many articles I dug up that were positive in nature talked about diversity of students as a result of introducing esports as a sports program. That, plus revenue generation, number boosting and overall increase of morale sets the tone that esports within higher education is a smart move. Overall, my opinion is, that a well managed esports program at a higher education institution is a fantastic idea. With the proper amount of care, it can be a huge boon to the university. Like a very good football team, it can put the college or university on the map. Sorry for rambling. I have all these thoughts that I have to stick somewhere. I have a unique insight to both worlds, and to see it become a possibility to merge the two is absolutely fascinating to me at the "data-loving-research geek" level. When He's Here....But Not "Here"
I was chatting to someone who, I had assumed, I explained everything about what my husband does. Me-"He's working from 12pm-9pm from this past Sunday to Thursday, so it's been a struggle"
Person-"Oh, he works nights then? Where? Is this a second job?" Then I forgot that, while she know about the very basics about what my husband does, I obviously hadn't explained what he does when he is not actually traveling for work. I have made many, many, many, many blog posts about what life's like while Breaky travels for work. I don't believe (correct me if I'm wrong) I have ever written about what life is like while he's working from home. 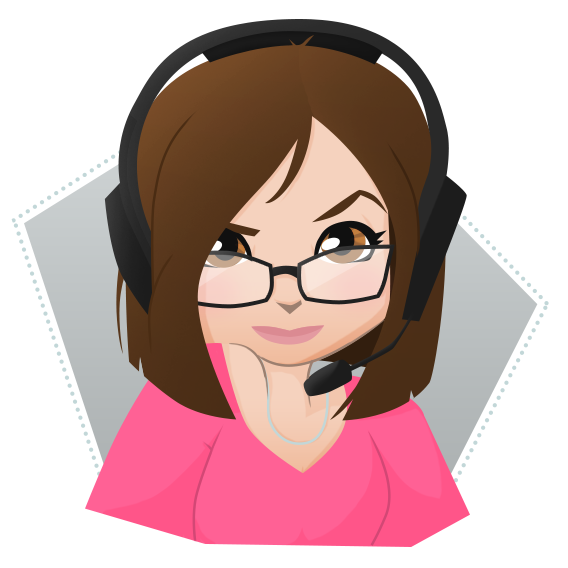 So, for those of you who may be new: My husband, BreakyCPK, is an "Esports Broadcaster" or "caster". Meaning, he does play-by-play for online video game tournaments and games. About 16% of that job involves big events to which he has to travel, often internationally. The rest is done at home, in our office, at his computer. Now imagine that coming from your basement for hours on end. I think our baby who is ALMOST 7 MONTHS OLD THE TIME IS GOING BY TOO FAST, is probably used to hearing that from downstairs by now. Honestly, it's probably just white noise to her now. 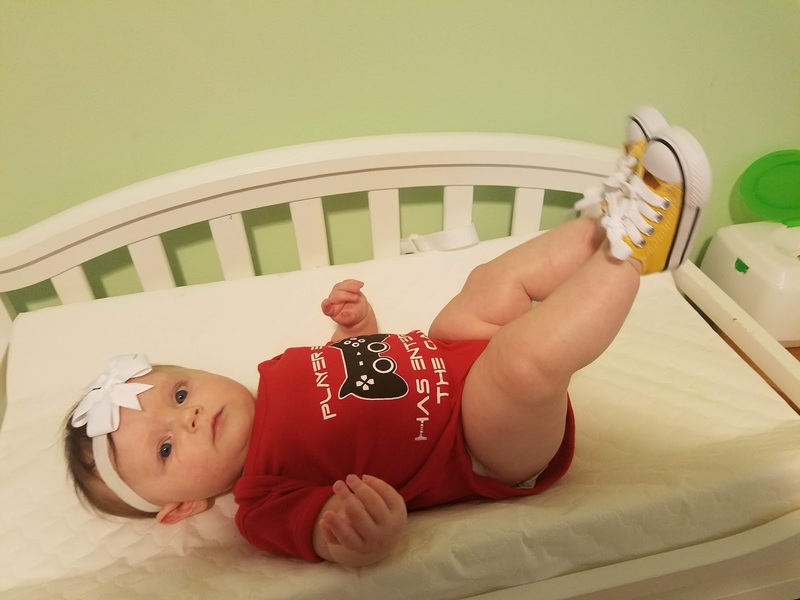 A gamer in the making! It's all just background noise to me now. People who visit? Yeah they notice. He can come visit on breaks and stuff, but when those would be? We never really know, and he could be unreachable for 3-4 hours at a time. 3. I prepare meals that can be eaten at anytime. As mentioned before, he never knows when his breaks are. So neither do I, which means I eat by myself, leaving enough for him to nuke and take downstairs. 4. I will often pop onto the twitch channel to see where they are in the match to get a good idea of how the night will go. I know enough about the game to know how much longer it could possibly take. Like who's winning, did it just start, am I going to be giving BabyCPK a bath by myself? Am I going to be able to shower today? It's weird. Missing someone who is in the same house as you. I do have BabyCPK, but conversational abilities are a little limited. Although it would be three times more lonely if I didn't have her.